Sugar Sand Beach with a u-shaped dock - check the view!!! Moultonborough, NH. 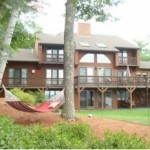 Incredible Lake Winnipessaukee lakefront home in a private park like setting with 370 feet of shore-front. Relax on the beautiful sugar sand beach leading to crystal clear waters and a large u-shaped, deep water dock featuring a boat lift and room for multiple water-crafts. Expansive decking faces 180 degree lake & mountain views beyond the lush lawns, beautiful gardens and mature landscaping. The home features 4 bedrooms, large modern kitchen with granite counters & stainless appliances. The lovely dining room is wrapped with glass to enjoy the mature landscaping. 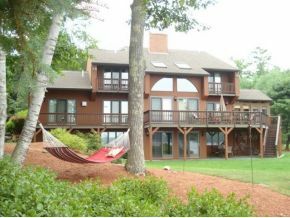 A large family room with fireplace & bar area in the full walkout lower level opens to views of the lake outside. This home has a fully enclosed yard with gated entry, large heated garage & spectacular views from nearly every room in the house. 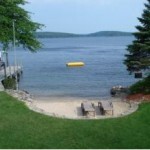 Lake Winnipesaukee is over 42,000 acres of summer and winter fun, tubing to snowmobiling. Skiing and golf is also close by. 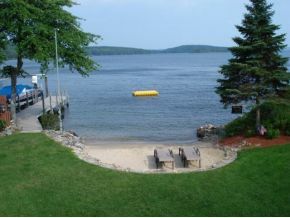 Listed by Century 21 Lakes Region Realty - For additional information on this home call Lady of the Lake Realty at 1-888-737-5550 or e-mail at info@nhlakesrealty.com or visit our website to view similar lake homes in New Hampshire at https://www.nhlakesrealty.com/ or www.lakeorskirealestate.com. Contact us today to see if this home is still available? ?